Pesto - pounded sauce by any other name - is my current obsession. It all started with a long, lazy Easter weekend with family on the outskirts of Paris. Four days of cooking, eating, drinking good wine and putting the world to rights. The all important drinking nibbles created by the lovely Lisa (cookery teacher and food writer at bien cuit gluten free) included a radish top pesto. A resourceful vibrant green dip for our crisp, pink French breakfast radishes. 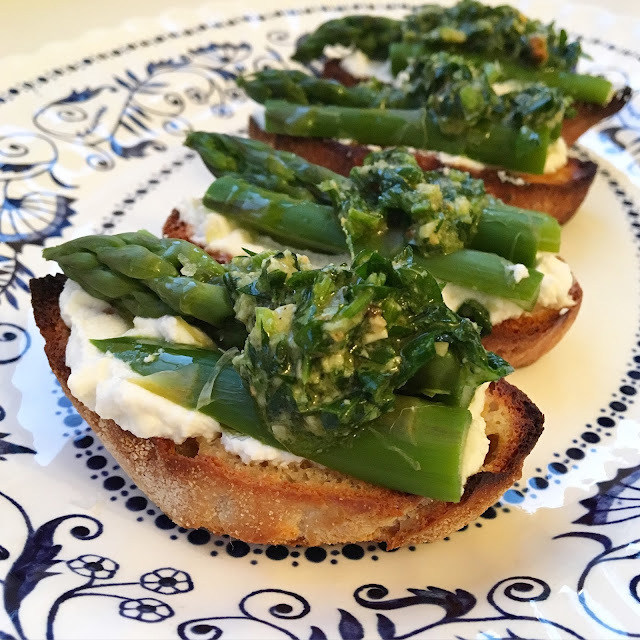 The pesto love-in continued when I returned home to find that my friend Jassy had posted her recipe for Wild Garlic & Pistachio Pesto. Bereft of wild garlic but with an abundance of parsley I set about pounding roasted garlic and some nibbed pistachios which really were well past their best. I skipped the parmesan because we were eating this particular pesto with a creamy little burrata. But thinking about it, I rarely put cheese in my pesto these days - I prefer the clean taste of the nuts and herbs - making it naturally vegan. This recipe came about, as many do, from opening the fridge door and creating something new. It's so easy to get stuck in a rut cooking the same meals week in week out, especially when there are little (demanding) mouths to feed. But I get bored. There is no pleasure in food that is solely for fuel, which is the way some meals can begin to feel when you're feeding a family. My boys would eat the same handful of meals in rotation given half a chance, with pasta and my 'pasta sauce' topping the list by a long way. That may make for an easy life now, but I wouldn't be doing my job (and what I truly believe is an important one) of exposing them to a myriad of flavours, textures, smells and sensations to set them up for a lifetime of enjoying food. So I cook for me, for them and for their future selves. I'm particularly fond of almonds with asparagus, but toasted pine nuts or cashews would work pretty well too. I'm all for using up what's in the cupboard rather than spending money on yet more ingredients to languish in their packets, unloved and forgotten. Slice the ciabatta into 10 slices, discarding the crusts at each end. Place on a baking sheet and brush both sides of each slice with a little olive oil. Toast under a hot grill on both sides until golden brown. Transfer the toasted bread to a wire rack to cool. Bring a large pan of salted water to the boil. Cook the asparagus in the salted water for 3-4 minutes until just cooked. Drain the asparagus and plunge into cold water to cool. Drain and then dry on kitchen paper. Slice each spear in half and then slice the thicker end in half lengthways, so that you have 3 pieces of asparagus, roughly the same length, from each spear. 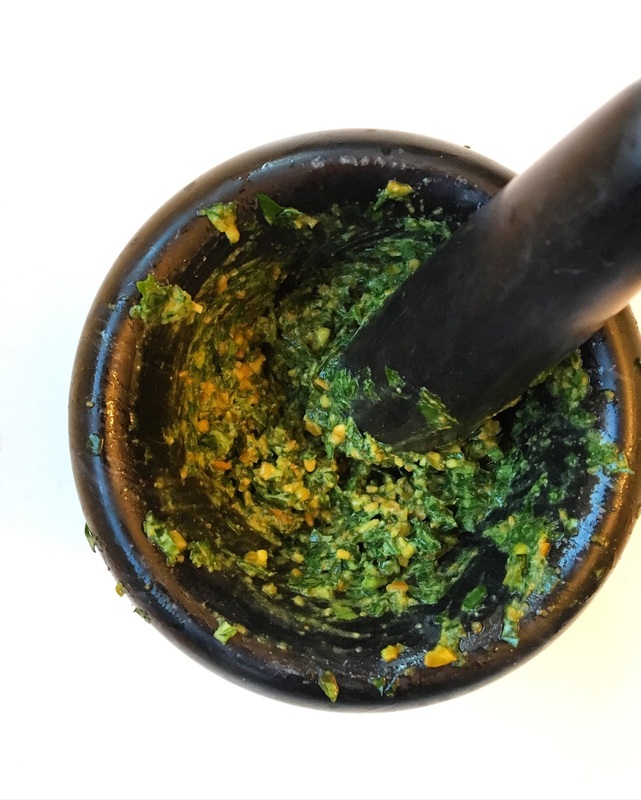 To make the pesto, using a mortar and pestle, pound the roasted garlic clove and salt to form a paste. Add the chopped toasted almonds and pound again until some of the almonds start to break down. Roughly chop the parsley (including the thinner stalks) and add this along with the lemon juice, black pepper and olive oil and continue to pound until you have a rough, chunky pesto. 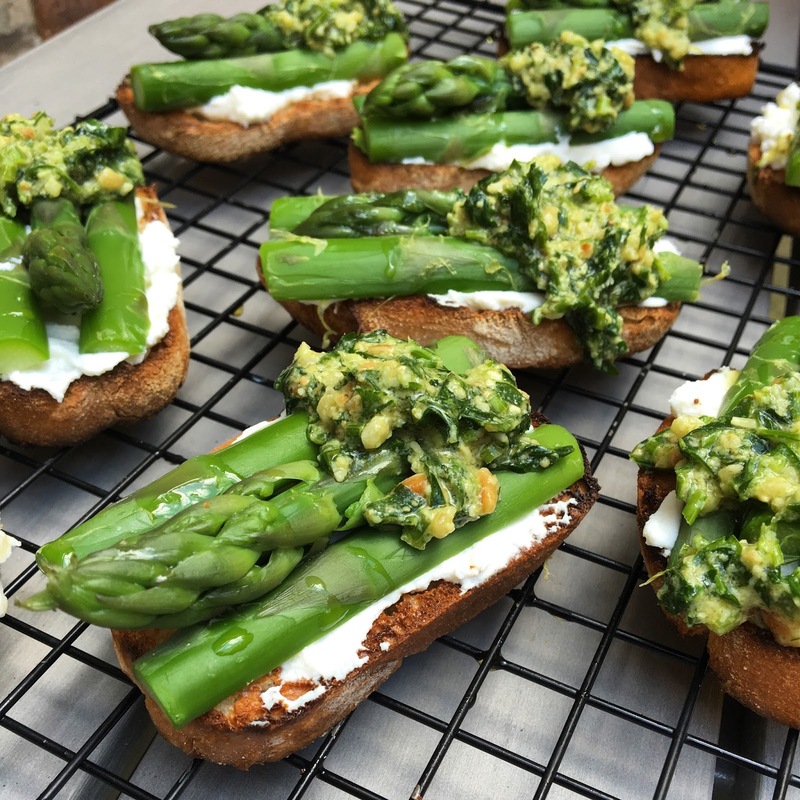 When you are ready to serve, spread a little ricotta on each crostini, top with the asparagus and a teaspoon of pesto. Drizzle with a little extra olive oil before serving.